Ablack-and-white psychological horror drama, set during Britain’s 17th-century Civil Wars and involving buried treasure and trippy hallucinations? Hi-ho, director Ben Wheatley and his co-writer wife, Amy Jump, are back in town. “A Field in England” is the latest and most fiercely strange film from Wheatley, who is himself the most fiercely strange filmmaker currently working in Britain. “Kill List” (2011) was a scuzzy little hit-man movie that turned surreal with paranoia; last year’s “Sightseers” was a cheerfully bleak comedy about a serial-killing tourist couple. “A Field in England,” like the others scripted with Jump, pushes into areas both avant-garde and bizarrely funny. The movie’s definitely something, although I’d be hard pressed to say what. Maybe Samuel Beckett’s idea of a period film. 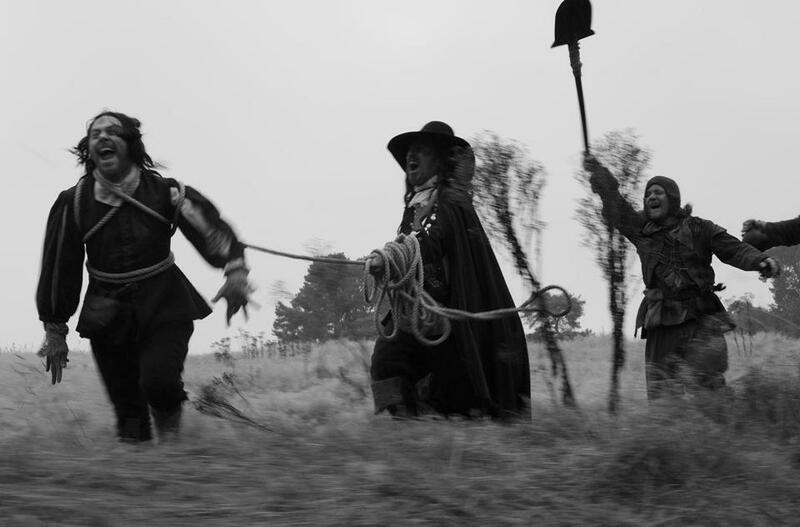 Shot in crisp wide-screen monochrome by Laurie Rose — oddly, I was put in mind of the classic Oscar-winning short “An Occurrence at Owl Creek Bridge” — “A Field in England” opens on the fringes of an anonymous raging battle, from which the dandyish Whitehead (Reece Shearsmith) is fleeing in terror. Joining up with two grizzled mercenaries, Cutler (Ryan Pope) and Jacob (Peter Ferdinando), and a gentle conscripted peasant known simply as Friend (Richard Glover), he high-tails it over the hedgerows. “We’re not running away, we’re going for beer,” insists Cutler. In fact, Cutler is bringing them to O’Neil (Michael Smiley), a lordly malefactor encamped in a field he believes has buried treasure in it. Using the prissy, appalled Whitehead — who has skills in divination — as a human truffle hound and the soldiers as muscle, he intends to dig until the treasure, whatever it is, is found. The ingestion of magic mushrooms leads to some psychedelic sequences. Did I mention the magic mushrooms? Finding them growing nearby, Cutler uses them to break down his captives’ defenses, and the filmmaker uses them to break down ours. “A Field in England” has an agreeable 1970s B-movie attitude toward recreational pharmaceuticals and gonzo psychedelic sequences, and toward the end — just as tensions are coming to a head — Wheatley uncorks a lulu, the film threatening to buckle under the assault of audiovisual wackness. Here might be the place to call attention to Martin Pavey, who has done the sound design for all Wheatley’s films and who creates frightening aural moonscapes that tilt the movie further off its axis.